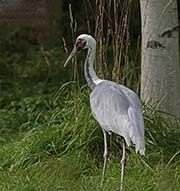 White-naped Cranes are found in parts of Russia, Mongolia and China. They are numbers are declining and to help bolster the population in the wild, U.S. Zoos are providing eggs to the Russian Khinganski Nature Reserve. 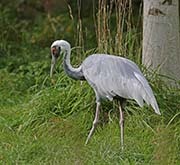 The White-naped Crane has a dark gray body and silvery gray wings and wing coverts. The head is dark gray with a reddish patch, a white throat and a vertical white stripe from the crown down the neck. The bill is long and light colored, the iris is orange, and the legs and feet are pinkish. Males and females look the same but the male may be slightly larger. Juveniles heads and neck are covered with cinnamon brown feathers. Diet: Diet includes roots, tubers, wetland plants, insects, small vertebrates, seeds and waste grains. On the Japanese island of Kyushu, artificial feeding stations have been set up to feed them. 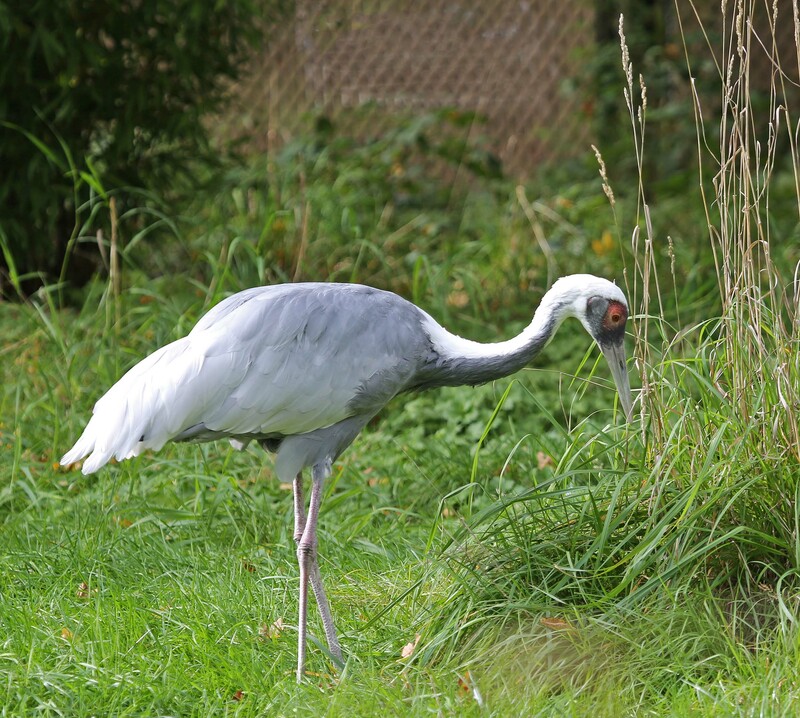 Courtship: Like other cranes, the White-naped Cranes mated pairs take part in 'unison' calling. 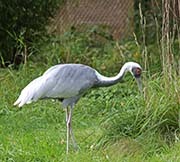 In the case of White-naped Cranes, the female initiates this behavior and she makes two calls for each single male call. While doing this, they usually have their heads thrown back and their beaks pointed skyward. Nesting: The nest is a mound made up of sedges and grasses in open wetlands and wet meadows. They will dig to reach food. Both sexes incubate the off-white with gray splotched eggs. The male also defends the nest. Habitat and Range: Found in shallow open wetlands, wet meadows, grasslands, and croplands. Range includes northeast Mongolia, northeast China, southeast Russia, Korea, southern Japan, and along the middle and low Yangtze River. Vocalization: They make high-pitched penetrating calls. 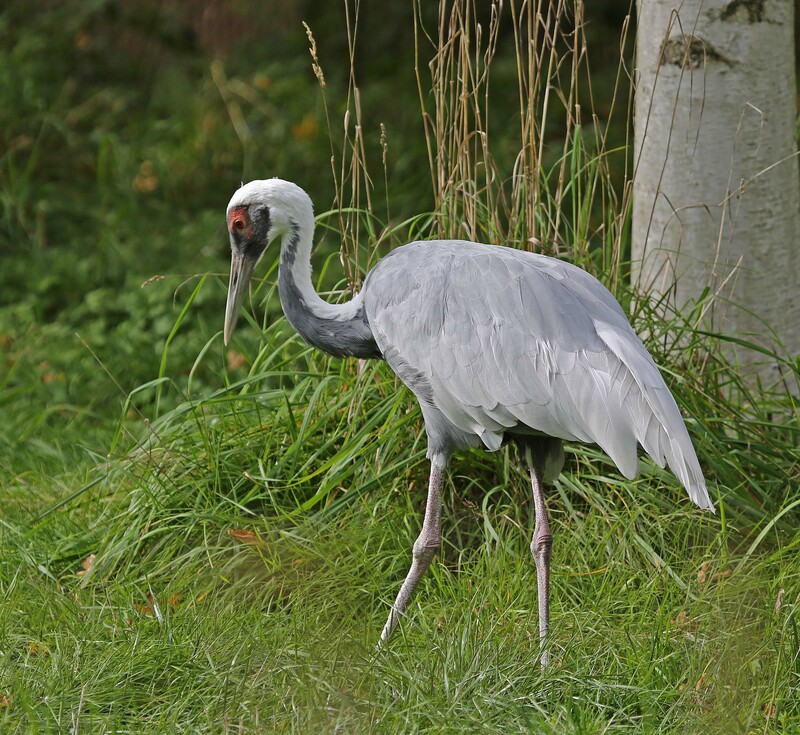 Plumage/Molt: White-naped Cranes do not have an alternate plumage. 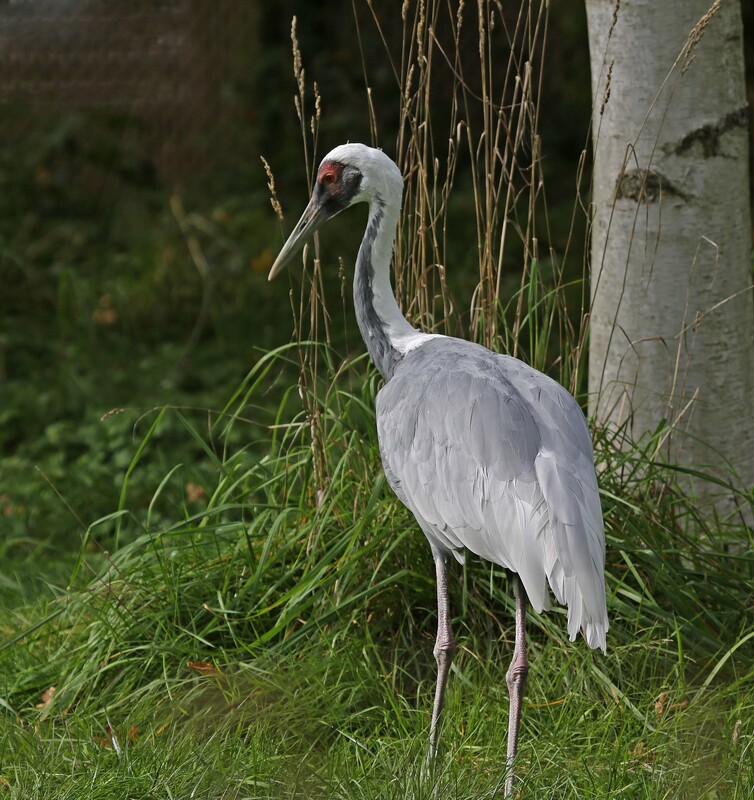 Migration: White-naped Cranes breed in northeastern Mongolia, northeastern China and southeastern Russia. They winter in the Demilitarized Zone between North and South Korea, the Japanese island of Kyushu, the Yangtze River, Kazakhstan and Taiwan. Tongue/feet: Pinkish legs and feet.